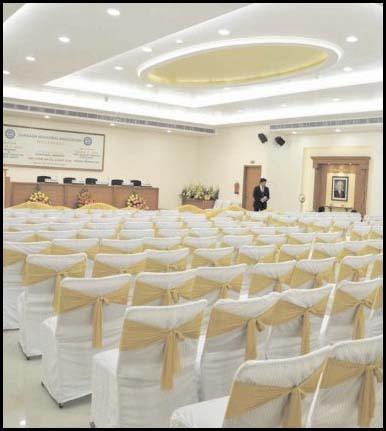 The user of the Conference Hall shall not Serve food inside the Hall except Soft Drinks & Snacks. Liquor is not permitted in the Premises. The security deposit of Rs. 5000/- shall be paid at the booking of the Hall which will be refunded after the use of the facility. Deduction will be made from the security amount if any damages are noticed in the Conference Hall during or immediately after the progamme. The President of GIA has the discretion to accept or reject the request for Hall Booking. Unless the organiser of the Programme receives the Confirmation from the President of GIA in writing, the request for booking of the hall shall be treated as not booked and after his canceling of the booking of the Hall, the same shall be treated as not booked. If the Hall is used for more than the time booked, the rent of the Hall will be charged as double and security amount will be forfeited. The users of the hall are not allowed to paste / clip any substance or banner on the walls of the Conference Hall.